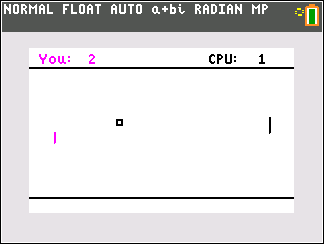 This program includes three games that has every thing to do with dots. It uses the home screen. Nibbles is a version of snake, which is very graphical and very fast. This version of snake is unique because it doesn't use any list variables to control the movement of the snake. You are an explorer in a very deep forest, and you need to escape it to civilization. You are on your motorcycle, your only way of transportation. Unless you prefer walking. Can you beat the high score? Good luck! The simple game of Spider entails arranging the pipes so the spider can crawl through them for as long as possible. There are 3 Difficulty settings which enable extra pipe sections, and make the spider move faster. A highscore table is avaailiable so you can boast to your Friends! An Angel Production.